Bengal was the home of both the Mongolian and the Dravidian populations, the Dravidians being more widespread in the southwestern areas and the Mongolians in the northeastern areas. Some groups of Austrics lived in the western parts. In the southeastern parts of Bengal, the Mongolians held an overwhelming majority over the Dravidians. The Chakmas, Tripuris, Bodos, Kochas, Kiratas, and Chuaras of the Mongolian population; the Kaevarttas, Bagdis, Dules, Shavaras, Kurmis, Mahatas, and Kherias of the Dravidian population; and the Santhaliis, Baoriis, Mála Páháriis [(Mála or Málo)], etc., of the predominantly Austric population, were the original Bengalees. Thus we see that West Bengal is a stunning example of racial and cultural variations and blendings. A study of marginalized groups in West Bengal reveals that the ancient indigenous Dravidian communities have been economically and culturally exploited for centuries, and continue to be so today. One clear manifestation of that exploitation was the resulting explosion called the Santal Rebellion of 1855-56. Other communities also rebelled. However, the strangulating exploitation by capitalists did not end. Today, it takes the form of economic globalization, i.e., global capitalism, evidenced by the recent revolt in Nandigram in Medinipur District. The CPI(M) government of West Bengal brutally crushed Dalit villagers fighting to retain their lands, which the state government had handed over to megacorporations such as, Tata Groups and Salim Group of Indonesia, by designating those lands as SEZs or Special Economic Zones. As repeatedly happens all over India, nothing was done for the hundreds of thousands of villagers who would be displaced from those lands, nor was anything said about rehabilitation, reparations and compensation, or the offering of new lands of equal value in another location. 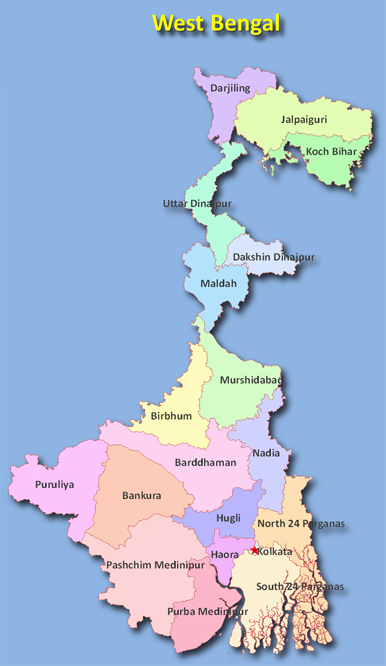 Since Partition in 1948 and the separation of West Bengal from East Bengal (now Bangladesh), West Bengal has a rather odd physical shape, with a large round conglomeration in the southern region which tapers into a thin strip leading to its northeastern most districts of Jalpaiguri and Cooch Behar. The term “tribe’ has various meanings globally, including ‘nation’, ‘society’ and ‘race’. In India, however, the term has a different meaning. The three characteristics of a tribe in India are (1) a group of people who are culturally and geographically isolated from the rest of society, (2) the social structure of the group is non-hierarchical and egalitarian, and (3) the community is invariably economically deprived. While western anthropologists have tended to categorize tribes as having the same language, culture and name, in fact these attributes can vary substantially within one tribe. Cultural boundaries of tribes in India cannot be so clearly defined. Since 1971 many tribes have moved from a tribal society to a ‘jati’ or caste society based on occupation. The system becomes more complex as caste is then further interwoven with class, again due to occupation. While some authors have maintained that caste is no longer a large issue in Bengal, this author would maintain that caste and not class continues to be a strong cultural issue and continues to be the prime reason for extreme economic deprivation, cultural isolation and lynching deaths. Caste remains the overriding factor. While a few pockets of tribals remain in the forests of Bengal, particularly near the Nepalese and Bhutanese borders, and lead their original lives from one century ago, a large majority of tribals, for reasons of economic survival, have moved towards villages and towns and become shudras or day laborers. According to Sekhar Bandyopadhyay, the “Sanskritizing” or Hinduizing of the middle peasant castes took place in the 1920s and 1930s, which involved a handful of prominent Dalit leaders who had once fought against the dominance of high-caste Hindus now merging with them and becoming ministers. This tokenism would bring the broader struggle by Dalits for social justice to a screeching halt. Of course, a handful of formerly downtrodden Dalit politicians is no indication of the socio-economic status of the remaining Dalit community. The right wing extremist Hindutva continues to use great skill in absorbing the lower castes so as to suppress and neutralize all dissidence. Interestingly, the leftist movements, manifested by the Bengal Provincial Kisan Sabha and the CPI and CPI(M) communist parties, like the Hindutva movement, are also dominated and run by the highest castes – the Brahman, Kayastha and Baidya castes. So while the communist parties claim that Dalits have been greatly benefited by land reforms enacted since 1977, in reality the main beneficiaries were the middle class peasants. The higher castes of any political persuasion in West Bengal or India will not take any steps that would disturb their place at the top of the caste hierarchy. As another example, while some Dalits run for election in the Gram Panchayats and win, invariably when they attempt to institute local reforms benefiting Dalits, the higher castes immediately pass a no-confidence resolution and remove them from office. In fact, when it comes to class versus caste, West Bengal is no different from the rest of India, and in some respects the lot of Dalits there is worse. Due perhaps primarily to the growth of the BJP and RSS cadres all over India, caste attitudes have increased, as reflected by Brahmin students in 2004 refusing to take mid-day meals at school that had been prepared by cooks of a lower caste. On 24 August 2004 the Asian Human Rights Commission reported the brutal police beating of a seven-month pregnant Dalit woman who was asleep with her children in front of her hut. She was awoken by baton sticks and then, when she could not produce her husband, who was fishing in a nearby creek, was mercilessly beaten. Chandra Bhan Prasad, President of Dalit Shiksha Andolan, states that the Left Front is no friend of Dalits. According to Prasad, during the Congress-dominated government in West Bengal from 1952-62, the percentage of ministers belonging to Scheduled Castes, Scheduled Tribes and Muslims was 2.3 percent, 6.9 percent and 12.7 percent. In contrast, during the CPI(M) government spanning 1977 to the present, the percentage of ministers was 1.5, 1.5 and 7.1. No Dalits can be found in the CPI(M) leadership. The economic situation of non-Dalits in West Bengal has improved, reflected by a decline in proportion of landless agricultural laborers by 3.89 percent. However, those who remain landless laborers are almost entirely Dalits. According to the 2001 Census, the total population of West Bengal is 80,176.197. Of this number 4,406,794 are Scheduled Tribes, which is 5.5 percent of the state population. Between 1991 and 2001 West Bengal registered a 15.7 percent growth of Scheduled Tribe population. According to the 2001 Census there are 38 notified Scheduled Tribes. The Census does not provide any information on denotified tribes. The Santal tribe represents 51.8 percent of the total tribal population, the Munda tribe 7.8 percent, the Bhumij 7.6 percent and the Kora 3.2 percent. These four tribal populations alone constitute 85 percent of the state’s tribal population. The Lodha, Mahali, Bhutia, Bedia and Savar tribes have a population comprising a minimum of one percent, while the remaining tribes have populations of less than one percent. More than half the Scheduled Tribe populations live in Medinapur, Jalpaiguri, Purulia or Barddhaman, with Bankura, Maldah, Uttar Dinajpur and Dakshin Dinajpur also having substantial tribal populations. The numerical populations of the larger tribes are presented in the table below. 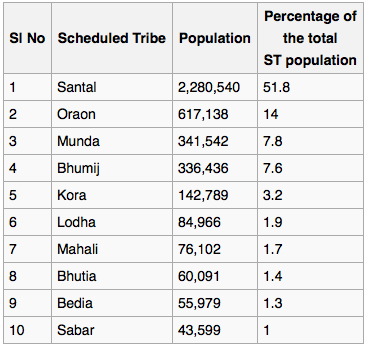 Population of Scheduled Tribes in West Bengal, according to Census of India 2001, Census Commission of India. Approximately 43 percent of the tribal populations have been deemed as literate, with the national average being 47 percent. The male literacy rate is 57.4 percent while the female literacy rate is 29.2 percent, a ratio that characterizes many developing countries, including Bangladesh. The Bhutia tribe has the highest literacy rate with 72.6 percent while the Savar tribe has an overall 26.3 percent. Slightly more than 50 percent of tribals in West Bengal attend some kind of educational institution. According to the 2001 Census of India, almost 50 percent of the scheduled tribes are employed, with 65.7 percent of those labeled main workers and the remaining 34.3 percent as marginal workers. The Savar tribe has the highest percentage of workers at 53.4 percent, while Bhutia has the lowest at 36.3 percent. This is the direct inverse of the educational or literacy rate of these two tribes. Of all tribes, 23.7 percent are cultivators and 45.1 percent are agricultural laborers. Only 5.3 of the Mahali tribe are engaged in agriculture. Herein we will discuss the Santal, Toto, Bagdi and Robi Das tribes of West Bengal. The Santals of rural and urban India are by far the largest tribe in India and also in Bengal. In West Bengal the Santals are the majority tribe and comprise more than 50 percent of the total scheduled tribe population. Other tribes include the Oraon, Munda, Bhumij, Kora, Mahali, Lodha, Bhutia and Malpahariya. In 2002 the Indian constitution identified the Santals as “scheduled tribals.” They are the third largest scheduled tribe in India. Indian culture originates from four racial groups: Austro-Asiatic, Dravidian, Tibeto-Chinese and Aryan. The Santals descend from the pre-Dravidian or Kol people who migrated to the regions of Jharkhand, Chattisgar, Orissa and West Bengal about three centuries ago, preserving to a large extent their language, culture and traditions. It is speculated that a region called Sant existed south of the Santal Parganas in Jharkhand, which may have been their original habitat. According to British documents, Santals were brought by Bengali traders in the first quarter of the eighteenth century and continuing to the mid-nineteenth century to what was then a much larger Bengal, to clear forests and scrub areas of the lush Gangetic plains for the Bengalis and the Rajas. In return they received one tenth of the land they cleared, leading them to settle there permanently. The land was used primarily for wet-rice agriculture. It led to their drifting from a hunting-gathering community to an agricultural community. In some instances, or in the beginning, while never accumulating wealth, they also did not starve. They knew how to work the land and how to produce the necessities for their survival, such as rope, bamboo beds, wooden and bamboo stools. Even today their thick-thatched roofs last for more than 30 years, while the women have mud cook stoves and keep the mud walls of their homes smooth and clean, covering the mud with white clay. They keep bountiful gardens with multiple varieties of vegetables (eggplant, cabbage, tomato) and flowers, all surrounded by bushes, banana and palm trees. In between their homes they dig ponds which meet all their bathing and drinking requirements. Domestic cattle provide them milk and other dairy products. In November and December they harvest the rice and then irrigate the land for a winter crop, such as mustard or wheat. They have led a simple but sustainable existence, and had mental peace as they interacted amongst each other in a spirit of coordinated cooperation and without any worry about time. From almost the very beginning, however, the Santals were exploited by moneylenders, who supplied them with oxen, plows, axes and food in the off-season while exacting exorbitant interest rates ranging from 25 to 100 percent. As a result, whatever land and goods the Santals acquired was repeatedly lost to the exploitative moneylenders. Due to plundering and stealing of their land, the Santals have faced continual exploitation, poverty and leperization, causing sometimes fierce rebellions, the most famous of which was the Santal Rebellion in 1855-56, referred to by historians as the Santal hul. Santal tribals fought with bows and arrows, axes and spears against the British armed with horses and rifles. Within a brief period more than 10,000 Santals were killed. While in public the British minimized the revolt as just one more rebellion, the immediate consequence was the awarding of a large agricultural area exclusively for Santal tribals. Until today many Santals continue to live in mud-walled, thatch-roofed houses in nucleated villages of 100-200 people, guided by a headman and assistant headman. Their status continues to be that of “below caste, equal, in fact, to the non-tribal outcastes.” However, according to Dr. George Somers, who lived with the Santals for thirteen years, they refuse to participate in the Hindu caste system. In West Bengal Santals occupy the jungle areas around Midnapore, and are poorly tolerated by the peasants in the plain regions of Midnapore district. However, according to Walter Hamilton, the Santals are “a mild, sober, industrious people, and remarkable for sincerity and good faith.” They lead lives of severe impoverization and starvation. While they are known to raise crops successfully, their worst enemy even today is the moneylender who takes advantage of their simple natures and charges them 100-150 percent interest on loans taken for seed. As their forests were gradually taken from them, many Santals moved north and cultivated land. In addition they worked in the coal and iron mines of western and eastern India and the tea gardens of north Bengal. In the late 1970s the Santals were mainly concentrated around Manbhum in southwest Bankura and in northwest Midnapore. While they live on the outskirts of villages due to their lack of social status, it is the Santals who cleared the forests over the years to create lands for the establishment of those villages. The highly egalitarian lifestyle of the Santals of one century ago became corrupted by the concepts of land ownership, private property and rental income, all introduced by the British. The method of extracting land from the Santals has always been exploitative. Invariably the tribals sold their land at pittance prices simply in order to pay their debts to the money lenders. The money lenders or Mahajan could fix the price of the land however they liked because the Santals had no idea about the market value. In April 2002 the Times of India reported the arrest of activist Kunal Deb in the Bolpur region of Birbhum District. He was accused of what he said were false pretenses in order to silence his fight for the fundamental rights of the Santals. According to Deb, a nexus of stone quarry owners and police filed charges against him in the town of Mallapur, which is located abut 50 kilometers north of Santiniketan in the deprived Rampurhat-I block of Birbhum District. The only work available near Mallapur is in the stone quarries. Quarry workers come from the extremely impoverished Santal tribes who are made to work ten and twelve hour days and paid a pittance. They are not provided with masks to protect them from stone dust, they are not provided health care in the form of hospitals, first aid centers or even crèche, nor are any schools provided. While blasting and crushing the stones, the tribals are injured and receive no compensation. In addition cattle have died due to being hit by flying stones. Adults and children fall sick with respiratory disease. The quarry owners, who are the wealthiest people in the region, ignore numerous environmental regulations and exploit the tribals mercilessly, even sexually exploiting the young tribal daughters whose fathers have no other source of income. As a result venereal disease and abortions are routine among the tribals. It is this kind of exploitation in history that has led to violent rebellion against the oppressors. To date, the Santals of Mallapur have seen no justice. The Totos are a Mongoloid tribe residing in the Dooars area of Jalpaiguri district in West Bengal. Compared to other larger tribes they are extremely isolated in the hills of the Sub-Himalayan region, enveloped by mixed hardwood forest and surrounded by rivers. Yet even the Totos have changed due to influences in the nearby environment. As of 1993 the Totos were designated as one of six underdeveloped Mongoloid tribal communities in West Bengal, along with the Mech, Garo, Lepchas and Bhutia tribes. They reside in Totopara of Madarihat police station. They have lived in the same region since the middle of the 18th century when they drove out the Rabhas, a weaker tribal group that moved towards Assam. They originally moved to Totopara to escape from western Dooars, where they had contracted diseases such as malaria, and also to escape from the more powerful Bhutia tribals. Due to ongoing wars with other tribals in the vicinity, only a small pocket of Totos remain in the present location, which lies south of the Tading Hills in Bhutan. The hill in fact marks the boundary between West Bengal and Bhutan. Their spoken dialect comes under the Tibeto-Burma family of the Sub-Himalayan group of languages. The Limbu, Dhimal and Nepali languages have to some extent permeated the Toto language, and more recently due to increased communication with the external world, the Toto tribals, aside from their own dialect, speak Nepali, Hindi and a corrupted form of Bengali. The nearest precinct is Madarihat, from where one can take a private bus to Totopara, although the bus plies on an irregular basis. The distance between the two precincts is 28 kilometers, and the road winds through river beds, forest and tea gardens. Sometimes the bus proceeds through knee-deep water in the rivers. Totopara lies at the foothills of the Himalayas with the tropical Titi rain forest running along its western and southern boundaries and the Torsa River to the east. As with other tribes, they originally had communal land, but with the advent of the British individual ownership was introduced and the once reserved land of the Totos became unreserved. Winters in Totopara are humid and cold and summers are humid and wet with an annual rainfall of 130 inches. The highest recorded temperature is 34.5 C and the lowest is 11.5 C. Due to sandy soil with gravel, crop production is difficult as water retention is difficult. Many valuable timbers such as papal, khayer, simal, sal, siris, dumri, lampute and chilauni grow in the forests, along with jackfruit, mango, orange and bamboo. Grasses grow near the Torsa River that runs near the community. The people live on fish from the river as well as snails and supplement their diet with roots, tubers, leaves and mushrooms from the forest. Additionally they grow spices like black pepper, ginger, turmeric and areca nut trees. They domesticate many animals, such as cows, goats, pigs and dogs in addition to fowl. Wild animals such as elephants, tiger and deer visit them regularly. Other tribes living in close proximity to Totopara are the Nepali speaking Tamang, Mangar, Rai, Chetri, Gurung, Kami, Sanyasi, Brahmin, Damal, Limbu, Ghale, Newar and Sarkar tribes. The life of the Totos is heavily influenced by Nepalese culture and habits. The Nepalese taught the Totos the practice of terraced paddy cultivation. Their traditional houses are made of bamboo split walls with bamboo platforms in front of the house called dui. The houses are built on wooden or bamboo posts about six feet above the ground. All materials for house construction come from the surrounding forest, including bamboo, catechu, and rope from the bark of the odla tree. The roofs are made with layers of thatched grass. To reach the platform a tree trunk or thick wooden plank is placed diagonally from the ground to the edge of the dui, hence serving as a staircase. The home comprises of one room divided into three sections: one for sleeping, one for guests’ sleeping, and the third section for ancestral deities. Guests are not allowed to enter the third section. The family animals such as pigs, fowl and other animals live in the space under the house. According to Amitabha Sarkar, the Toto tribals were a perfect example of a bridge community, as they were engaged in carrying edible goods such as salt and rice from the plains to Bhutan and then returned carrying oranges and other jungle products from Bhutan to sell to the people of the plains. Thus they played an important role by maintaining a trade line between the two regions. About one century ago the main crop of the Totos was oranges. In 1925-26 almost the entire orange orchards of Totopara were destroyed, most likely due to deforestation, which caused the micro ecosystem to change, including soil erosion and increased temperature. It is further speculated that the orange trees were unable to tolerate the sun’s direct rays. In more recent times the Totos cleared more of the forest to give space for crop cultivation. Using only organic cow dung and their own indigenous seeds, they presently cultivate maize, millet, pulses, paddy, potato, sweet potato tapioca, ginger, green vegetables, drumstick and areca-nut. Of these their cash crops are areca-nut, ginger and drumstick. Generally for four-five months annually the tribals are unable to survive as their stored food runs out. At that time they work nearby as daily laborers. If work is not available, they come near to starvation. Due to their location in the Sub-Himalayan forests, the Totos have accumulated an intimate knowledge of their environment, including of medicinal plants. They do not use allopathic medicines. Instead, for example, for skin disease they apply the paste of the leaves and fruits of Lutodabai (cassia alata Linn), for ulcer and headache they apply the juice of the leaves of Daising (Cordia dichotoma). For stomach pain they take the juice of the bark from the Lungdi (Glochidion assamicum); For cold and digestive problems they take the juice of the Makaibi (Drymaria Cordata) or they roast and inhale the fumes of these leaves which cures the cold. To stop bleeding they apply the paste of the Duba (Cynodon dactylon) and for diarrhoea they take the juice of the root of the Sadhimodi (Emilia Sonchifolia). For eye problems they apply the juice of the Sadhimodi leaf (Emiila Sonchifolia), and for gum bleeding they apply the juice of the Dirisai leaves (Kirganelia reticulata). For simple fever they take the juice of the Pagra root (Laportea erenulata). For small pox they apply the powdered leaves of the Harsoo (Pothos scaridens) and make the stem of the same plant into a paste to use as a poultice on any fracture. Either they find the medical plants themselves or they take the help of the medicine man in the tribe. About nine percent of the Totos are literate. That much literacy has been achieved with the establishment of a primary school in the village in the 1950s. The greatest curse for the Totas as for other tribes are the moneylenders or mahajans. The Totos are very simple, innocent people. The do not understand the value of money. Hence it becomes extremely easy for the mahajans to exploit them. Thus many Totas take loan from the mahajan to meet their daily necessities and then repay the loan later with areca-nut, bamboo, maize, millet and other produce, and receive hardly anything for these goods. Hence although it is a type of barter system, it is extremely exploitative. Due to the large export of tiger prawns from West Bengal, the Bagdi (Meendhara) community of the Sunderbans delta are receiving increasing attention. The Sunderbans has naturally available prawn seeds in large quantities throughout the year. The Meendharas harvest those seeds and sell them to middlemen or directly to breeders who then grow them and export them for huge profits to other countries, with Japan and the US being the biggest buyers. In a study of the fisherfolk of Kamdebnagar village under Patharpratima Police Station in South 24 Parganas district of West Bengal, anthropologists R. Ray, I. Chakraborty and N. Bhattacharyya of Kolkata University gained detailed knowledge of the Bagdi community as well as of their exploitation by middlemen and prawn breeders, which keeps them barely at subsistence level. Meen or prawn seed collection is the mainstay of the Kamdebnagar residents. The soil of the Sunderbans delta region is not overly suitable for agriculture due to the brackish water flowing in from the Bay of Bengal; hence, the villagers found prawn seed collection not only a viable alternative but also more lucrative than agriculture, although in the off season the men continue to grow rice. Since the 1980s the Indian government began to export prawn in large quantity to foreign markets. Kamdebnagar village lies in the extreme southeastern corner of West Bengal and is surrounded by Kolkata on the north, North 24 Parganas on the east, the Bay of Bengal on the south and the river Haora on the west. A portion of Midnapore district also meets South 24 Parganas on the western boundary. Although creeks and rivers criss-cross the district, South 24 Parganas remains very short of sweet water, accentuated by regular tidal waves that inundate coastal areas and destroy both crops and soil. In some villages, including at Kamdebnagar, cross-bund type embankments are constructed to thwart the tidal waters. Immigrants came and cleared the forests in the Sunderbans Delta region and rendered it suitable for rice cultivation, with the bulk of immigrants coming from the drought and famine prone regions of the Eastern Plateau, from Jhargram, western Medinipur, Bankura, Singhbhum and Santal Parganas. Most immigrants were tribals such as Santals, Mundas, Oraons, Kurmis and Koras; however, a few families were low-caste Hindus, such as from the Mahishva, Bagdi and Kayastha communities. Population growth in the Sunderbans Delta was slow due to snake bites, animal attacks, malaria and other diseases. Risley in 1908 wrote that as per the extant caste hierarchy only degraded or low-caste Brahmins would serve Bagdis and barbers would not cut their hair or shave them (leading them to evolve their own barbers), According to Risley (1891), the Bagdis were a tribe that had now been converted to a caste. Sixty-three castes in West Bengal have been listed as scheduled castes. The Bagdis are one of those listed castes and reside almost exclusively in West Bengal. In addition there are more than sixty sub-castes within the Bagdi caste. They comprise one-fifth of the state population and can be found in every district of the state. The vast majority reside in rural areas. The present Bagdi population in Kamdebnagar village is 223. The people live in thatched huts clustered around an open space in the center of the village, with each hut comprising two rooms, one for sleeping and the other for storage. Each hut has one window and a wooden door. The kitchen is on the verandah. In the particular village of Kamdebnagar, there is no caste sentiment; rather, all multiethnic groups are united in their struggle for economic and physical survival. The Bagdis are the Meendharas, the fisherfolk. The word fisherfolk is used because the women and children do more fishing than the men. Women and children are constantly in the water (year round) collecting meen or prawn seeds (baby prawn). Men also fish but in the off season they cultivate paddy or work as day laborers in nearby villages to supplement the meager income from prawn seed sales. Meen fishing and the making of fishing nets along with rice cultivation are the traditional occupation of the Bagdis. Today many of the men became landless laborers in order to survive during the off-season when income from prawn seed is too meager for survival. Of their present population, no female is alive over the age of 60. The Bagdis are of short stature, reflecting their aboriginal Dravidian descent, and do not eat beef or pork. Higher castes generally do not accept water from them. Bagdis practice monogamy and worship Manasa, the snake god. According to P.R. Sarkar, the snake god Manasa was created from people’s imagination purely due to fear of snakes. West Bengal has the highest number of snakes of any state in India. Bagdis keep cattle, goats, sheep, fowl and ducks, and consume eggs from the poultry and milk from the cattle. Cattle are also essential for crop cultivation. The Meendharas own small plots of land which are not large enough to enable sustainability. Their homes are built on higher ground above the paddy fields so as to provide more protection from tidal waves. Land boundaries are not clear, and all villagers use the central open space as a common area. In addition to rice they cultivate chilies, ladies finger (okra), eggplant, pumpkin and other vegetables. The Bagdis raise just one crop during the summer months and harvest in the fall. In winter the land is inundated with brackish water and utilized for prawn raising; thus, directly after harvest the Meendharas are busy catching prawn seeds. When the prawns are fully grown they are lifted out of the water with nets and the field is once again drained of water and made ready for agriculture. The fishing implements are hand-operated nets, boat nets, aluminum pan for keeping the prawn seeds alive in saline water, rope for dragging the fishnets, an iron dish used to segregate the prawn seeds from other fin and shell fish, and shells, which are also used to pick out the meen, i.e., prawn seeds. (Since when segregating the prawn seeds, the other fish are simply thrown on the embankment to die rather back into the water, the ecological diversity of the Sunderbans is continuously damaged ecologically.) These fishing tools are essential for every Bagdi family, as it their only means of survival. The Bagdi men sometimes sell the meen in the nearby markets. More often middlemen come and purchase the prawn seed from them in the village and in turn sell them to breeders. When the prawns reach full size, the breeders process them and export them to other countries. The amount of prawn seed collected varies depending on the lunar calendar followed in Bengal. The high tide brings in more fish and the low tide brings less fish. Hence the quantity of fish increases depending on the rate of increase of the water towards the new moon and full moon. Aside from the tidal effect, the summer southerly wind brings more seed, and hence the largest meen collection occurs in the summer months. Winter months bring the lowest number of meen to the delta. The Bagdis only collect the prawn seed. They do not grow prawns or engage in pisciculture. They are engaged only in aquaculture. They catch prawn seed and sell them to middlemen or directly to the breeders. In either case, the payment received for their labor is pitiable. In the summer season the Bagdis receive Rs. 200 per thousand prawn seeds. In the rainy season they receive Rs. 250 per thousand. In the autumn they receive Rs. 16-40 per thousand, and in the winter season they receive Rs. 400 per thousand. It is during the lean season when the prices go down to Rs. 16-40 per thousand that the men go in search of daily labor. Breeders pay the middlemen twice as much as what the middlemen pay the Bagdis. They pay from Rs. 800 to 3,000 per thousand. Adult prawns are then sold headless in foreign markets. Five headless prawns weighing one pound are sold for US $23.00. Using the current exchange rate of Rs. 39 for one dollar, this comes to Rs. 897 for just five prawns. For one thousand large prawns the cost abroad will come to $4,600.00, which converts to Rs. 179,400. The Bagdis sold one thousand prawn seed for as low as Rs.16 per thousand, and that seed was sold in turn to foreign markets for Rs. 179,400. Like the Totos, the Santals and the Rabi Das, they cannot do any other work. In addition, they face daily the occupational hazards of being attacked by crocodiles and sharks and being bitten by snakes. Due to being year round submerged in water, they succumb to malaria and other diseases. The simple Bagdis through their daily labor of catching prawn seed are reaping huge profits for the Indian government and for private capitalists, while their personal poverty is heart-rending. It is the decreasing catch of fish that drives the Bagdis to purchase land and turn to agriculture to supplement their income. In a study of another fisherman community in the coastal villages of Hara and Sultanpur, also in South 24 Parganas District, sociologist Dr. Sankar Kumar Pramanik determined that 76 percent of their meager income went for food, four percent for clothes, less than one percent for education, three percent for medical expenses and 12 percent on miscellaneous expenses, including fishing gear and loan installments. Generally each male in the village purchased two dhuties (cloth wrapped around the waist and covering the body from the waist down) annually and women purchased two sarees annually. Some families could not even afford this much. They also cannot afford to eat the fish they catch. Everything is sold to the middlemen or at the market. The lives of the fisherfolk in West Bengal are grim primarily due to the grinding poverty that causes them first to borrow money for food, for survival, and then due to the utter mercilessness of the moneylenders forces them to sell their everything – their land, their crops, their boats, fishing equipment, nets – to make the loan payments. It is a structural violence, a systematic pauperization caused by capitalist exploitation, as the fisherfolk live in abject impoverishment while middlemen and prawn breeders live comfortable upper middle class to wealthy lives. Each day they go into the water to collect more prawn seeds simply to avoid sheer starvation. Heavy pollution along the coast of Bengal has greatly decreased the number of hilsa and other fish as well as prawn. The appalling poverty has other repercussions. It leads to mental torture that causes disintegration of the joint family, while barely retaining the nuclear family structure. According to Pramanik, more than 80 percent of fishermen in 1993 earned from Rs. 300-600 per month. The Rabi Das are another marginalized urban community. Originally they were leather workers and used to do tanning, shoemaking and shoe repair. They came originally from Bihar about one hundred and fifty years ago and settled in and around Krishnagar, which is about 100 miles north of Kolkata. Each home had a workshop for shoe production. As they were a low-caste community (still earlier termed a tribe), they originally lived outside Krishnagar town proper, because the higher castes considered tanning and leather work a filthy job, and hence the people who did this work were “untouchable.” This attitude strongly prevailed up until 1947. The history of the Rabi Das comprises three periods: (1) their settlement and occupation as tanners and shoemakers, which ended when (2) the Gandhian social reformers brought tanning to a halt and sought to educate the Rabi Das, and finally (3) the present decline in demand for leather work, which has led to great unrest in their community. Today, however, the homes of impoverished high-caste Brahmins completely surround the homes of the Rabi Das. Additionally, in the late 1940s Gandhian social reformers worked closely with the Rabi Das and convinced many of them to give up tanning while encouraging them to continue their trade of shoemaking. They also taught them proper speech, etiquette and social habits like daily bathing and wearing clean clothes. As a result, the younger generation particularly has been able to blend in far more than their elders, as there is nothing distinctive physically to set them apart from the surrounding local Bengalis. Even if the younger men belonging to the Rabi Das have no employment, which is often the case, they will still bathe and dress in nice clothes and congregate with other young men, instead of taking up any manual work or daily labor, which they now consider beneath them. The younger generation that managed to gain some formal occupation now have taken up other typical artisanal occupations such as rickshaw driving, umbrella repair and domestic service. This is a community of traditional leather workers that has been monetarily marginalized by economic globalization. While economic globalization and liberalization have greatly expanded the leather industry, the older generation engaged in tanning and shoemaking has been completely marginalized in the process. The Rabi Das live in a para (neighborhood) along Hemanta Sarkar Lane at the junction of the local market and the Jalangi River which runs through the town of Krishnagar. As of 1990 there were 37 families and 225 members of the community. Most of their homes are made of brick, are whitewashed and in need of repair. A few families live in homes of thatch and bamboo. Generally several homes of relatives adjoin one central courtyard. While boys as they grow up are not made to work hard around the house, girls are given duties as young as nine or ten years of age. They include washing the dishes after meals, sweeping the verandah and courtyard, making the beds, cleaning the stove as well as the courtyard with dung, making tea and preparing breakfast, washing clothes, chopping vegetables and cooking meals, going to the market, and collecting cow dung and firewood. In addition, if cash is required, young girls work as domestic help in middle class homes for wages. While men of the elder generation maintained a tight control over their women, the younger generation merges far more with the values of their Bengali counterparts. However, they continue to differentiate themselves from Bengalis by exerting rather strict control over their women with the view that the seclusion of women defines their dignity and respect. It is in rather sharp contrast to Bengali women, many of whom are in the workforce. As a result, the young Rabi Das women feel often rebellious at such control and even reluctant to marry, knowing in advance the kinds of social and economic restrictions that will be placed on them. They are furthermore heavily influenced by both Hindi films and western films, where women are shown as rejecting the role of passivity and instead have the freedom to yearn for and indulge in romantic relationships. Despite these external environmental influences, most young girls ultimately resign themselves and are married to men of the Rabi Das community, to continue the same lifestyle as that of their mothers. While as mentioned the Rabi Das girls work very hard, boys are protected from hard work throughout their growing up. Instead they play and later study in the name of obtaining a good or higher occupation in future that can support the family. According to the research of Ganguly-Scrase, however, the young men do not study hard or have high educational goals; instead they long for a life of affluence that is shown to them day in and day out by the media, particularly by television. As elders understand that their sons cannot earn a living by leather work, they do not push their sons to go into their trade. Instead their sons are sent for government training in leatherwork which equips them to work in large leather factories such as those established by Bata Company all over India. It is ironic that if a young Rabi Das man is a “leather engineer,” he is treated with respect by Bengalis. But his father, whose skills in tanning and shoemaking are far superior, is treated with contempt by Bengalis today. For the young men it is a dilemma. Neither can they carry on with their father’s trade because there is no income, nor can they manage financially on the meager wages given in low-level white collar jobs. They aspire to be bhadraloks (respectable people) like their Bengali compatriots but economically remain chotoloks (lowly people associated with lowly occupations). No words, no beatings … the look in his eyes was enough to make you cry. When he was angry his look was fatal… he loved us intensely. He was equally authoritarian, although the love exceeded his discipline over us … That sort of love cannot be found anymore. Perhaps we do not love our children as much as our father loved us. Even those people who come to work for you are wearing fancy clothes and lipstick. They work in domestic service in the day time, but at night they get dressed up and hang about with boys. You do not recognize them at night. As young brides living in the home of their new husband, however, their status in the new joint family is the lowest, as is typical of the patrilineal and patriarchal household of the Rabi Das. Young brides are expected to engage in domestic work alone and not to have any other interests. According to Ganguly-Scrase, as a direct result of structural adjustment programs and neo-liberal policies, the poverty is increasing in the Rabi Das community. The huge influx of cheap plastic and polythene sandals signaled the start of Rabi Das displacement in the 1970s as plastics began to replace leather shoes. Even repair work was eliminated since plastic shoes were simply discarded after use. According to this author, the growing impoverization crosses all castes and geographical regions of India and is not at all restricted to the Rabi Das tribe or even West Bengal. We have already seen how the Santals are severely exploited by capitalists in the rock quarries of Burdwan and how capitalists have stolen the precious lands of the simple Totos in the sub-Himalayan region, leaving them in dire economic straits. Lynching refers to execution of a person or persons, either by hanging, burning or beating to death, without due process of law, in response to a perceived outrage and performed with the idea of vindication or revenge. Samit Kar, Reader at Presidency College, Kolkata, has compiled painful statistics on the ghastly occurrence of lynching in the state. According to Kar, the rate of lynching is rising sharply as a rural phenomenon, as villagers, frustrated at the inaction of law authorities, take matters into their own hands and mete out their own collective mob punishment on so-called criminals. In addition, he attributes the unique three-tier Panchayati raj system as contributing to the more aggressive mentality of village subalterns in comparison to subalterns of other states. He further attributes the rise in lynching to the global growth of attributes such as intolerance, hatred and restlessness, caused partly by the capitalist economic model and economic globalization that has permeated even the rural regions of India. Still other factors include crime, drug abuse, high unemployment, stress, financial debt, no health care, lack of drinking water, poor education and ethnic tensions, which permeate both global and rural villages. Uncontrolled consumerism combined with deprivation of fundamental human rights leads to individual and collective aggressive behavior as people seek a way to vent their unbounded frustrations. Villagers blame lynching on the police who fail to arrest spiraling crime rates. According to the Police Crime Records Bureau, West Bengal, 2002, the state-wise crime figures are as follows for the years 1997 to 2000: In Bankura district the total criminal cases, including dacoity, robbery, burglary, theft, murder, rioting came to 1246. Lynching deaths were 10. In Birbhum district, there were a total of 2132 criminal cases and 7 lynching deaths. In Burdwan district, there were a total of 5171 criminal cases and 25 lynching deaths. In Coochbehar district the total criminal cases were 1385 and lynching deaths were 23. In South Dinajpur the total criminal cases were 1210 and lynching deaths were 67. In Darjeeling the total criminal cases were 1555 and the number of lynching deaths were13. In Hooghly district the total criminal cases were 3633 and the number of lynching deaths were 52. In Howrah district the total criminal cases were 2559 and lynching deaths numbered 68. In Jalpaiguri total criminal cases were 2411 and lynching deaths were 41. In Malda district total criminal cases were 1916 and lynching deaths were 5, with no data for the year 2000. In Midnapur district the total criminal cases numbered 5231 with lynching deaths 29. In Murshidabad district total criminal cases were 2906 and lynching deaths 39. In Nadia district total criminal cases were 3462 with lynching deaths totaling 61. In North 24 Parganas total criminal cases were 6454 and lynching deaths came to 109. In South 24 Parganas total recorded crimes were 6395 and lynching deaths 99. In Purulia district the total number of crimes recorded was 1495 and lynching deaths totaled 8. In North Dinajpur total criminal cases were 1843 and number of lynching deaths 38. Reasons for the rise in lynching as given by the villagers themselves include increasing awareness of their own empowerment through the three-tier Panchayat system; a marked rise in criminal activities, ineffective police action against criminals and an indifferent judicial system. A further exacerbation according to the villagers is the unholy nexus between the police and the criminals, with criminals obliging the police with a share of the stolen goods in return for the police keeping mum. Thus, villagers claim, the lynchings are a matter of self-defense. Relative to other states of India, West Bengal after Independence made significant advances in the area of land reform, literacy, forestry, cottage industries and other areas. The rural people took an active role in the development of their own communities, and hence implemented a system of grassroots decentralized planning. In addition to earlier mentioned causative factors for lynching, two more factors put forward by Kar include (1) the absence of a towering personality at the village level who serves as a moral role model for the people, and (2) the fact that mobs are anonymous entities, hence individuals in a mob can indeed get away with murder. Kar puts forward several solutions, including (1) the formation of Resistance Groups who essentially will inform the police who lynched whom; (2) Police Villager Workshops, wherein greater understanding should develop. However, in the absence of a commitment to higher morality amongst the police officers, what purpose would such workshops serve? While Sumit Kar makes the claim that caste or class has no relation to the lynchings in West Bengal, the award-winning novelist and famed tribal rights activist Mahasweta Devi tells a different story. In her article “Year of Birth – 1871,” she talks about the utter indifference of Indians to the word “tribe.” Yet tribals, she says, have no rights. They are denied the right to earn a living, to proper housing, drinking water, electricity, health care, food, clothing, education and the very crucial right to land. All are denied to tribals. Politicians shout big slogans and obtain huge amounts of money to “uplift” the tribals, but their plight remains unchanged. Mahasweta Devi, now 82 years old, spent the past thirty years working with the tribals of West Bengal as well as other states. She calls theirs a “faceless existence.” Although they have existed in India for thousands of years and have a mighty civilization, including song, dance, and art, they are faceless. Although thousands of tribals organized countless rebellions against the British in the 18th and 19th centuries, persons like Gandhi, Puley and Ambedkar barely mention their contribution towards Indian independence. According to Mahasweta Devi, the tribals of West Bengal and other parts of India are far more civilized than other sections of Indian society, because they have no dowry system or divorce and widow remarriage is wholly accepted by the society. Despite their higher civilization, they routinely face disease and death from starvation. Capitalists over the decades have robbed them of their precious forests and they have no way to survive outside the forests. The only role tribals play in the 21st century is to watch how their land is taken for dams and other megaprojects while they themselves are displaced and redisplaced as per the whims of state and federal governments. While India is caste-divided into upper and lower castes, the tribals are below the lowest Hindu castes. The sole intention of the federal government is to detribe the tribals. One of the greatest crimes committed by the British during their occupation of India was to legally brand certain nomadic tribes as “criminals,” by passing the notorious “Criminal Tribes Act of 1871.” These included simple cattle-grazers, wandering singers and actors. All those tribals who dared to resist the British occupation of their lands were branded as “criminals” and belonging to “criminal tribes.” Between 1871 and 1944, more tribes continued to be added to the existing list of “criminal tribes.” After Independence in 1952, the Indian government officially “denotified” the criminal tribes; however, they made no provisions for their rehabilitation into mainstream society. They made no arrangements for these branded “criminals” to be given jobs so as to earn an honest living. From 1961 onwards the Indian federal government has published state-wise lists of “Denotified and Nomadic Tribes.” The police in every part of India are taught the names of the “Denotified tribes.” To add insult to injury, the police forced these tribals to steal and then share the stolen goods with them. Sometimes the police took everything and then had the person killed. According to Mahasweta Devi, the denotified tribes are jailed, mob-lynched and tortured to death by the police not just in West Bengal but all over India. She provides three examples from West Bengal, the home of three denotified tribes, namely: Lodha, Kheria Sabar and Dhikaru. Between 1979 and 1982, 42 Lodha tribals were mob-lynched, not for crimes but for being born as “Lodhas.” Between 1960 and 1998, more than 50 Kheria Sabars were mob-lynched or murdered by the police. In June 1997 Lalit Sabar of the Kheria Sabar denotified tribe was tied to a tree and his arm chopped off. In February 1998 in West Bengal Budhan Sabar was tortured and then subsequently died in police custody. Mahasweta Devi filed a case in the Kolkata High Court over his murder. In October 1998 Mathur Sabar of the Kheria Sabar denotified tribe was speared to death by villagers. These are only a few cases in West Bengal. Numerous other cases exist in other Indian states such as Gujarat, Maharastra and Rajasthan. The denotified tribes throughout India are victims of mob-lynching and death at the hands of the police. As Mahasweta Devi says, “… this monstrosity of keeping a section of Indian people branded as born criminals is an unforgivable sin.” Due only to their birth, they are condemned for life to live outside the society and denied all fundamental human rights. It is time, she says, to remove the year 1871 as their year of birth. In 1998 Mahasweta Devi, along with Laxman Gaikwad (Sahitya Akademi award winner for his autobiography, Uchalya), Tridip Suhrud (Gandhi scholar) and rural researcher Ajoy Dandekar, sat together and created Budhan, the Denotified and Nomadic Tribes Rights Action Group Newsletter. In the first issue of Budhan they published a complete list of denotified tribes, which included the Nats of Bihar. The National Campaign on Dalit Human Rights carries an article on their website informing about the ten Nats who were lynched to death by higher caste people of Dhelpruva Village of Vaishali District in Bihar. The lynching had no connection to any crimes committed. It was a mass lynching by an upper caste mob. Mahasweta Devi writes of scores of incidents where Lodha and Kheria tribals were compelled to steal by the police and other receivers of stolen goods, for which they were given pittance for survival. Essentially, having the status of “denotified tribe” makes it easy for anyone – Dalit, caste Hindu and Muslim – to kill them. According to this author, here is the real source of lynching in West Bengal and elsewhere. It can only be rectified by coming to grips with the caste system and implementing harsh laws to punish hate crimes based on caste sentiment. Haldia is a town in Medinipur about 150 kilometres from Kolkata. It is situated near the mouth of the Hooghly River, and is a major port for shipping of bulk goods. Companies already based in Haldia are Indian Oil Corporation, Exide, Shaw Wallace, Tata Chemicals, Haldia Petrochemical and Hindustan Lever. At present its population is about 171,000, but it is growing fast. For this reason, the neighboring district of Nandigram was considered to be ideal for setting up an SEZ (Special Economic Zone). In February 2006 the federal government operationalized the SEZ Act of 2005 and so informed the SEZ Rules in February, 2006. SEZs are specially demarcated zones in which entities are to operate under specialized rules that pertain only to those entities and not to the people on the lands outside the SEZ or in the entire rest of the country. Entities/companies occupying SEZs are national or transnational companies which are supposed to attract foreign direct investment (FDI). As per the new laws, any private, public, or state government can set up SEZs. Overseas multinational corporations can also set up SEZs in India. Considering the potential consumer population, this scenario is an economic paradise for transnational corporations. Companies are given 100 percent tax exemption for the first five years and 50 percent for the following two years. Developers may import goods without paying duty and will enjoy tax exemption for from ten to fifteen years. In addition they will have the authority to provide essential services such as water, electricity, security, restaurants and recreation centers. These terms are just tailor made for US corporations. The SEZ laws state hardly a word regarding the displacement of and reparations to farmers and fishermen who lived on SEZ land. The West Bengal government chose Nandigram to be an SEZ on behalf of the Salim Group of Indonesia. It is to cover 250 square kilometers. Whereas China has only six large-scale SEZs, in India an unlimited number of smaller SEZs have been proposed, which will threaten economic development in non-SEZ regions. The resulting land wars are likely to lead to civil war. State governments are using the police to invade the lands of farmers and kill them, including the tribals. The farmers and tribals are simply defending their lands which are guaranteed to them in the Indian Constitution. On December 1st, 2006, the state government seized at gunpoint some 997 acres of SEZ designated land in Singur under the colonial Land Acquisition Act of 1894. That land is now controlled by Tatas Corporation. It has been cordoned off and a four meter high wall has been constructed all along the border, which is manned by police and security guards. Who knows what has happened to all the villagers displaced by this land seizure. Along with other corporations, West Bengal has also invited Dow Chemicals (formerly known as Union Carbide, responsible for scores of thousands of deaths in Bhopal) to invest in West Bengal. A point of interest is the caste composition of successive Left Front governments in West Bengal. While in other Indian states the proportion of upper caste MLAs (ministers) has declined, in West Bengal it has steadily increased. About two thirds of the state ministers come from one of the three highest castes – Brahman, Boddhis and Kayasthas. In 1987 CPI(M) goons/hoodlums attacked peaceful Dalit protestors, who were afterwards persecuted by the police. On January 2, 2007 the Nandigram Block Development Office (BDO) posted an announcement on their door announcing the forthcoming seizure of land in the locality for the purpose of creating an SEZ – a Special Economic Zone. The news spread like wildfire among the people, and on January 3rd a group of villagers marched to the local Panchayat office in protest. The Panchayat members called the police, and the police responded by lathi-charging the protestors. The villagers then torched two police vehicles and attacked the Panchayat office. That day eleven people were killed, with the police and government/communist cadres on the one side and the poor villagers on the other. By the end of the day, the CPI(M) party members were driven out of the area by the outraged villagers. The CPI(M) – communist government of West Bengal could not tolerate this peasant uprising, and on March 9th and 12th announced there would be police action in Nandigram. Witnesses said the number of police who arrived in Nandigam on March 14th ranged anywhere from 700 to 3,000. The police carried not only the standard lathi but also .303 rifles and semi-automatic assault rifles. They were armed to the hilt. In other words, the decision to use maximum force against the practically unarmed villagers was a premeditated one. They did not carry with them forms of non-lethal crowd dispersal equipment. We cannot say that this was a protest or riot. It was a war. In addition, the CPI(M) cadres formed the vanguard of the army along with the police, and they had their own guns and swords as weapons. Some were even dressed as policemen. The villagers placed women and children at the front of their march, thinking that the police and communists would not attack them. They were wrong. The invading army unleashed a brutal carnage on both the women and children. The police hardly spent any time telling the crowd of villagers to disperse. Instead, they proceeded to shoot and slash the villagers to such an extent that two days later when observers visited they found the streets covered in blood. Upwards of 150 people were killed that day, with CPI(M) cadres loading bodies into trucks and driving off. Women were mercilessly raped and tortured. Afterwards many more people were reported missing. The goal of the police and CPI(M) cadres was to terrorize the villagers. Most of the villagers came from the Scheduled Castes, the Dalits. Many other villagers were Muslims, another minority group. These groups are always the easiest targets for governments and capitalists. As they are already near complete powerlessness, it becomes very easy to seize their lands. If suppose the residents of Nandigram had belonged to the Brahman or other higher castes, we can be certain that the area would have never been selected as an SEZ. Invariably those lands are selected where the poorest of the poor, the tribals, the scheduled castes and denotified tribes, reside. It remains easy for state and federal governments to displace them. However, in Nandigram the brutality of the government has only served to radicalize the dispossessed villagers. In early November CPI(M) squads began to move into party strongholds including the Takhali Bhangabera Bridges which both led to the land occupied by the Bhumi Uchched Pratirodh Committee (BUPC), which is backed by the Trinamool and other opposition political parties. On November 4th and 5th more CPI(M) squads came from Haldia by sea and prepared for what they called “Operation Recapture.” Their first assault occurred on November 5th. As they were so heavily armed and in such huge number, they quickly retook Satengabari and other neighboring areas. From November 7-9 they captured Maheshpur and Amgachia, two BUPC strongholds. Along with recapturing these areas there was widespread looting and arson. On November 10th their “Red Brigade” crossed the Bhanganbera bridge and proceeded to capture the BUPC stronghold of Sonachura. On November 11th came the final assault on Nandigram proper, which was followed by CPI(M) victory rallies. As of December 6, 2007, the communists occupy Nandigram and the farmers have fled for their lives. The number of women raped, houses razed and protestors shot and slashed is unknown. The media have been silenced. The villagers of Nandigram and Singur have become heroes. Local poet-singers have composed songs that have already become the anthem across the entire Konkan belt. Copied CDs of the songs are couriered from one taluka (district) to another. Demonstrations and marches have become a normal part of the daily routine. Former fishermen and farmer associations have been converted overnight into anti-SEZ movements. The farmers and fishermen are fighting for their land, because it is not just their land, it is their sacred mother. India has long been an agrarian, decentralized economy, which has given political and economic empowerment to local communities based on the 73rd and 74th Amendments of the Indian Constitution. Chief Minister Buddhadeb should think twice when he celebrates his victory in Nandigram. The people in that region have a long history of rebellion against oppression, and countless great revolutionaries and freedom fighters such as Khudiram Bose and Matangini Hazara have taken birth in Medinipur district. It was the people of Nandigram who were at the forefront of the Khilafat movement of 1921, the Salt Satyagraha of 1930 and the Quit India movement of 1942. 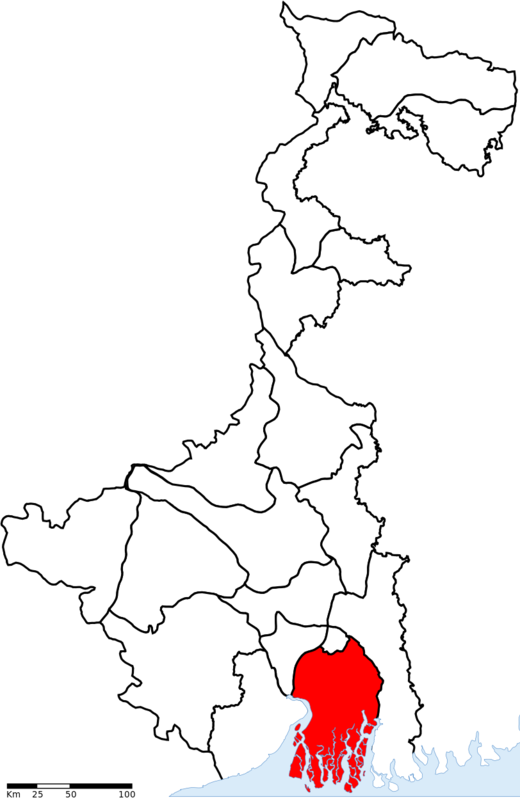 The August Revolution of that year took its most pronounced and militant form in Tamluk and Contai in Medinipore, a district already famed and loved as the most anti-British or freedom-loving district in the subcontinent.” The Tebhaga movement – the peasant struggle of 1946 – took birth in this region. Hence, the battle for freedom from corporate oppression is not yet over. In studying the marginalized communities of West Bengal, it can be seen that invariably the notified and denotified tribes, the scheduled and backward castes, the Dalits, are severely economically oppressed and culturally persecuted. We have seen that the Santals are exploited in the rock quarry mines in Medinipur as well as by moneylenders. The Totos in their simplicity also end up in the clutches of moneylenders. The Bagdis, in their innocence and powerlessness, work inhuman hours in the waters of the Sunderbans, facing crocodiles, water snakes and then tigers in the forests, and sell their prawns for a few rupees while breeders export them for a profit of hundreds of thousands. The Rabi Das have had to deal with the impacts of globalization as plastic and polythene shoes have replaced leather shoes and made their traditional occupation practically obsolete. Elders due to their illiteracy and poverty are no longer respected by their offspring, yet the children remain impoverished due to their own inadequate education. All of these tribes and castes have an ancient civilization and culture going back 2,000 years. The legacy of exploitation of these beautiful, marginalized communities has culminated in the current conflict brought on by corporate land-grabbing under the euphemism of Special Economic Zones. Throughout India peasants have helplessly watched their lands being seized, be it for corporations or megadams. In Chattisgarh the peasants are ground down by government and unofficial, government-sponsored militias. In addition, these peasants face assaults by conflicting Maoist groups. In Nandigram, however, we have a different scenario. We see peasants standing up and fighting for their own land under continual military assaults. This is the first armed struggle against SEZs in India. It is also the first armed struggle against mega corporations and corporate globalization in the world. Already other groups in India are learning from the heroic peasants of Nandigram and are forming their own resistance movements to fight the national and foreign corporations invading their lands. The traditional paradigms of farmer suicides and meek acquiescence are coming to an end. A new era of resistance and rebellion is beginning that will inspire the victims of SEZs and economic globalization not merely in India but throughout the world. Hence, the world needs to keep a close watch on the noble farmers of Nandigram. The shots fired by those farmers in self-defense have now echoed around the world, and will crescendo into a world revolution against the tyrannies of capitalism. Shrii Prabhat R. Sarkar, A Few Problems Solved, Part 1, Kolkata: AM Publications, 1959. Pradip Kumar Bose, Classes and Class Relations Among Tribals of Bengal, New Delhi: Ajanta Publications, 1985, p. 10. Sekhar Bandyapadhyay, Caste, Culture and Hegemony: Social Dominance in Colonial Bengal, New Delhi: Sage Publications, 2004, p. 243. Malabika Bhattacharya, “Casteist row over mid-day meals,” The Hindu, New Delhi, Nov. 19, 2004. Chandra Bhan Prasad, “Left Front is no friend of Dalits,” Communalism Combat, February, 1998. West Bengal Data Highlights: The Scheduled Tribes Census of India 2001. George E. Somers, Ph.D., A Santal Saga: Facing the Twenty-First Century, Self-published, 2002, p. 3. Ranjana Ray, Indranil Chakraborty and Nandini Bhattacharyya, “ A Study Among Some ‘Meendharas’ of Sunderbans, West Bengal,” in Anthropology: Trends and Applications: Anthropologist Special Issue No. 1:83-89, 2002, p. 1. Satadal Dasgupta, Caste Kinship and Community: Social System of a Bengal Caste, Madras: Universities Press, 1986, p. 27. Ranjana Ray, Indranil Chakraborty and Nandini Bhattacharyya, “ A Study Among Some ‘Meendharas’ of Sunderbans, West Bengal,” in Anthropology: Trends and Applications: Anthropologist Special Issue No. 1:83-89, 2002, p. 2. Prabhat Ranjan Sarkar, Ananda Vacanamrtam, Part 11, Ananda Marga Publications, 2008. Ranjana Ray, Indranil Chakraborty and Nandini Bhattacharyya, “ A Study Among Some ‘Meendharas’ of Sunderbans, West Bengal,” in Anthropology: Trends and Applications: Anthropologist Special Issue No. 1:83-89, 2002, p. 3. Sankar Kumar Pramanik, Ph.D. Fishermen Community of Coastal Villages in West Bengal, Jaipur: Rawat Publications, 1993, p. 131. Ruchira Ganguly-Scrase, Ph.D. Global Issues: Local Contexts: The Rabi Das of West Bengal, Hyderabad: Orient Longman, 2001, p. 152. Ruchira Ganguly-Scrase, “Globalization and Gendered Social Transformation: Young People’s Lives in an Urban Artisan Community in India,” Children, Youth and Environments, 14(2), 2004, p. 47. Ruchira Ganguly-Scrase, Global Issues: Local Contexts: The Rabi Das of West Bengal, Hyderabad: Orient Longman, 2001, p. 151. Ruchira Ganguly-Scrase, Global Issues: Local Contexts: The Rabi Das of West Bengal, Hyderabad: Orient Longman, 2001, p. 215. Ruchira Ganguly-Scrase, Global Issues: Local Contexts: The Rabi Das of West Bengal, Hyderabad: Orient Longman, 2001, p. 8. Ruchira Ganguly-Scrase, “Globalization and Gendered Social Transformation: Young People’s Lives in an Urban Artisan Community in India,” Children, Youth and Environments, 14(2), 2004, p. 60. Ruchira Ganguly-Scrase, Global Issues: Local Contexts: The Rabi Das of West Bengal, Hyderabad: Orient Longman, 2001, p. 163. Samit Kar, ‘Measure for Measure’ – Lynching Deaths in West Bengal: A Sociological Study, Kolkata: K.P. Bagchi & Company, 2006, p. 3. Mahasweta Devi, “Year of Birth – 1871” at India Together: www.indiatogether.org, March 2002. Laxman Gaikwad, The Branded: Uchalya, New Delhi: Sahitya Akademi, 2005. Mahasweta Devi, “Year of Birth – 1871,” India Together. www.indiatogether.org, March 2002. Mahasweta Devi, “Hated, Humiliated, Butchered,” Tehelka, November 12, 2007. Vandana Shiva, “From Corporate Land Grab to Land Sovereignty (Bhu Swaraj),” Zmag, 10 February 2007. “A CPI(M) Public Relations Coup: Response to Naom Chomsky, Howard Zinn, et al on Nandigram.” Outlook India, Nov 25, 2007. Smruti Koppikar, “Selective Exclusive Zamindaris,” Outlook India, February 7, 2007. Nitish Sen Gupta, Bengal Divided: The Unmaking of a Nation (1905-1971), New Delhi: Penguin Group, 2007, p. 80. Thanks to PROUT for the publication of the extensive study of the subject. The article helps those who are working for Revolutionary Social Transformation. Wish to read more such serious articles. Thanks a lot to the Author and PROUT for sharing this article to us, interested readers. hoping to get more of these.